Roy’s BBQ isn’t the only Columbia City restaurant readying to call it a day. Kallaloo, serving Caribbean Creole cuisine since 2006, will close after service January 29. “We had a five-year plan,” says Gail Williams, who was raised in Trinidad and Tobago and runs this mom ‘n pop shop with her husband, chef Kal Gellein. That plan included finding more time for themselves after five years of hard work. Their view: “If we couldn’t step back, we’d either get out of it or scale down.” Now, with their lease up — and the economy down — getting out became the right move. Never been? Well, there’s no time like the present to stop in for some St. Lucia-stuffed plantains, Guyanese Pepper Pot and Barbados oven-fried chicken (menu and hours listed here). “We’ve had a successful venture,” says Gellein, whose restaurant has hosted some of Seattle’s finest musicians during its Columbia City tenure. And though they’ll miss their patrons and the neighborhood’s diversity, closing is “a conscious decision, a fabulous decision,” he says. 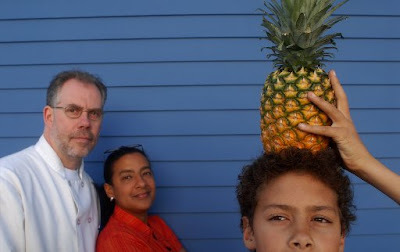 Gail Williams says she and her husband, Kal Gellein are looking forward to spending more time with their son Chris (seen hoisting a pineapple in 2006), now a high school sophomore. [Seattle Times/Erika Schultz].